1982 : The 82,000 dwt bulk carrier Robert LD (III) is launched in Trieste, and would be renamed Manga in 1984, and Cetra Vega in 1987. Its sister ship, the Louis LD (V) launched in 1983 is renamed as the Cetra Lyra in 1988. Cetragpa continues its development and LD adds the 140,000 dwt Cetra Sagitta built in Japan in 1982. The same year, a 27,200 dwt vessel built in Japan in 1974 joined the fleet: Dominique LD later renamed La Chesnais in 1988. 1983 : The small 1977 built Sophie B with a capacity of 7,000 dwt would be operated by the group before becoming the La Briantais in 1988, used on humanitarian missions. 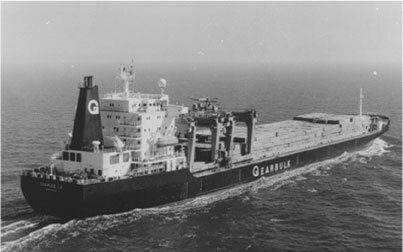 1984 : François LD (VI) and Monique LD (I), two 39,000 dwt ships built in Poland were destined to enter Gearbulk’s fleet. They were of the same type as the Charles LD (IV) and Pierre LD (IV)built in 1979 and 1980, but they were equipped with Mitsui porticos. 1985 : The last order from Gearbulk is placed : two 43,000 dwt vessels were launched in Korea by Hyundai: Alain LD (IV) and Charles LD (V), recognizable thanks to their seven hatches’ aperture system. 1987 : The 140,000 dwt Cetra Corona built in 1982 by Kawasaki and delivered to Cetragpa, entered the LD fleet. This same year, the group takes complete control over Cetragpa’s fleet and activities, specialized in heavy bulk transportation. 1990 : The LD fleet invested in Gearbulk was sold, after twenty years of an intense activity in various forms of transportation : bulk cement, clinkers, wood pulp, steel pipes, steel products, locomotives, machinery, sulphur, bauxite, aluminum ingots, containers as well as the usual bulk commodities world-wide, mainly Australia, North Africa, North America, East and West coasts, Gulf of Mexico, Canada, Japan Brazil and the Arabian Gulf. La Fresnais, a 30,000 dwt vessel built in Spain in 1976 completed the handysize fleet. Two Panamax type vessels were added to the fleet: the 75,000 dwt Leopold LD (V) – formerly La Pampa of 1982, and the 65,000 dwt Charles LD (VI) – formerly Lake River of 1986. 1991 : The 113,000 dwt bulk carrier La Loma (V) built in Japan in 1979 joined the Buries Markes fleet.